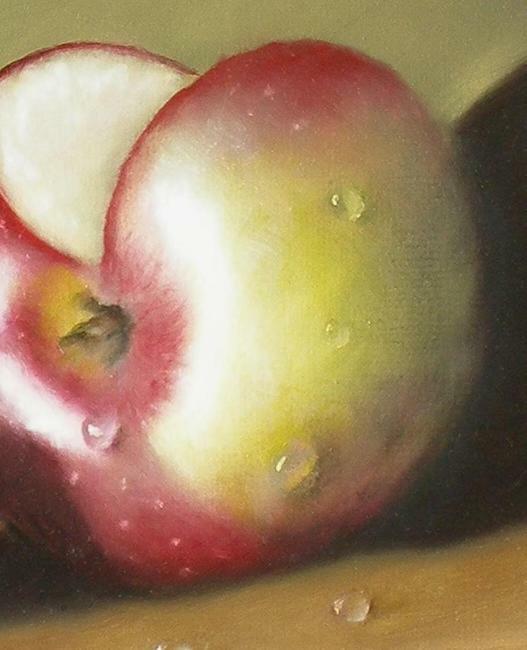 Apple Paintings, a series that will leave your mouth watering to bite a crispy red delicious! 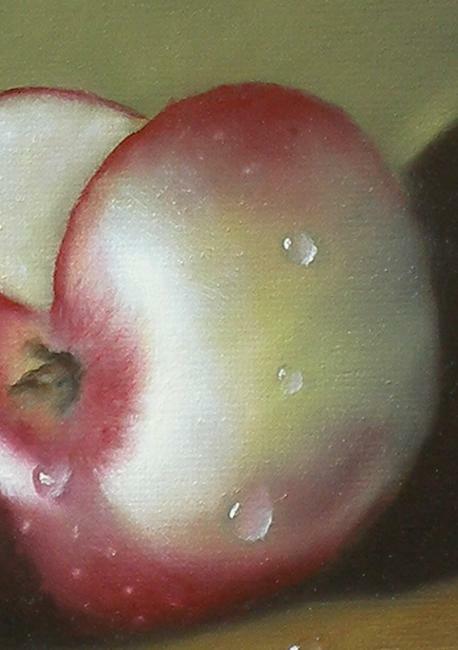 Here we have a small series of apple paintings. Why paint an item several times for a series? There are many reasons. For me, it allows the opportunity to fully explore a subject. To get to know the subject matter deeply, so that in future paintings, these things are remembered. It also allows me to present to customers various views of the same thing because rarely is just one veiw the best layout or composition. I can also incorporate slight variations in colors or backgrounds. 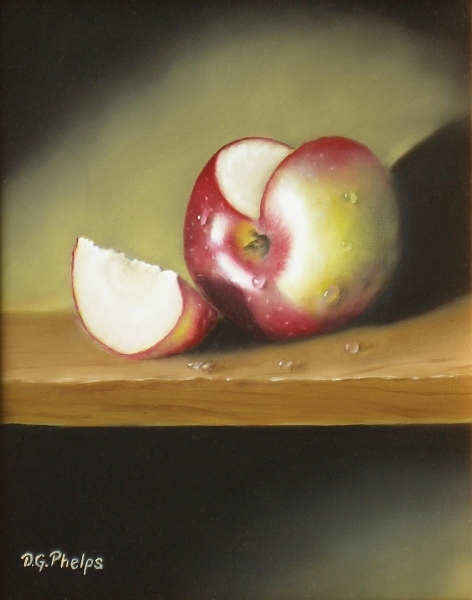 Even change a few elements within the series, as in this example, the shelf for the apple to rest on. Here are the three paintings. Click on an image to zoom in! Now lets discuss these paintings for just a bit. 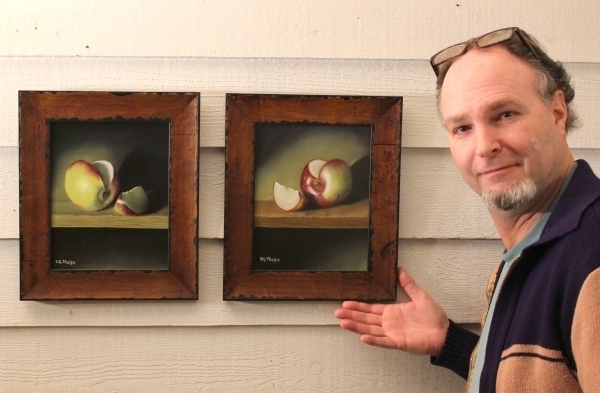 These painting are of the same apple with minor changes in position of the apple slice. In the first, the slice is on the right, the second on the left with the apple turned slightly, then the final with turning the apple and changing the shelf (purely imaginative by the way). 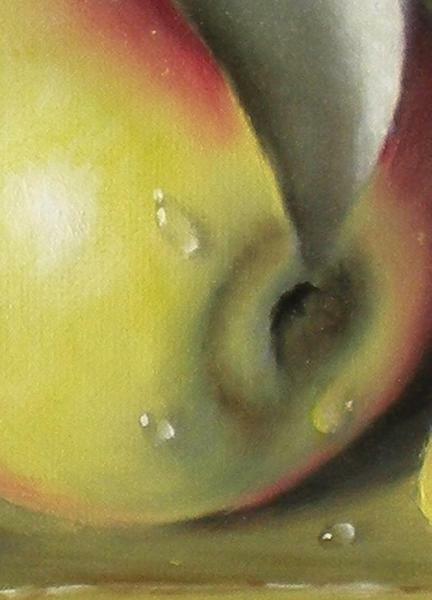 Warming up the apple painting with a glaze! So, usually, after a painting is drying for a bit, I will have another really close look at it before shipping it off to the gallery. And usually, because I'm a bit OCD, and a perfectionist, I'll find something that I dislike. If it's a major change, well, I usually don't fool with those, but a minor change, as in these paintings, I jump right in. After oiling out the piece and prepping my palette, I begin the process. One of the things I did with these also was to change their overall tone. 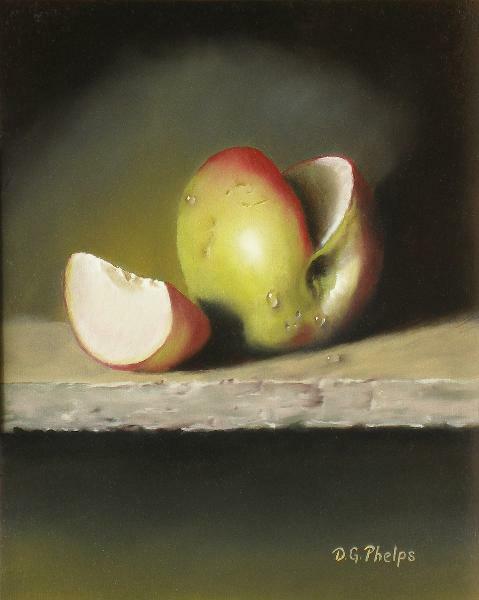 Once completed, they simply appeared on the cold side with the green within the apples, and I wanted these to be a bit warmer. 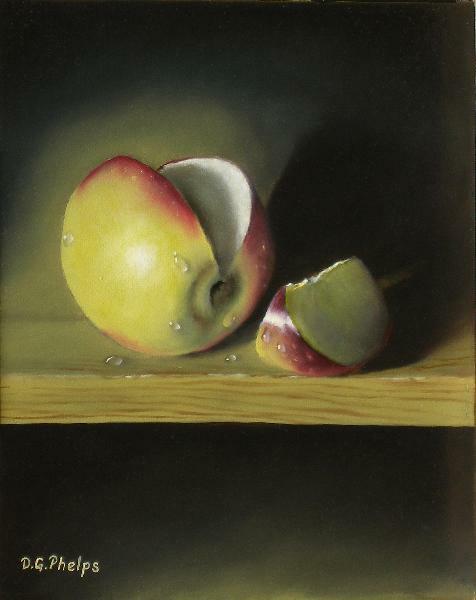 This was achieved by a simple glaze of cadmium medium yellow, which is a warmer yellow than cadmium light yellow. Adding a large amount of medium (linseed oil and alkyd dryer) to the warm yellow paint, and painting into the area's I wanted warming up. 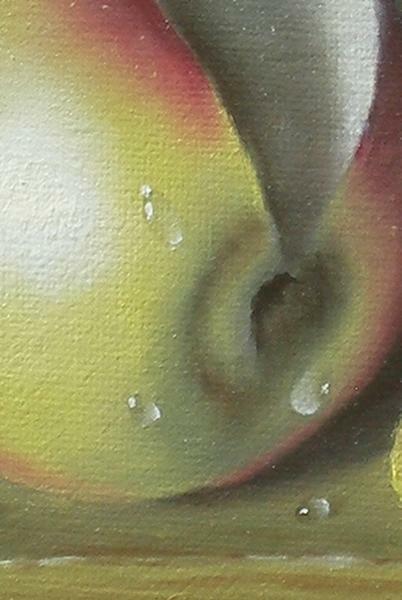 I also added a few more details like bruising or blemishes on the apple skin, and corrected some of the shadows within the dew drops. Do click an image to zoom in even more to the work.